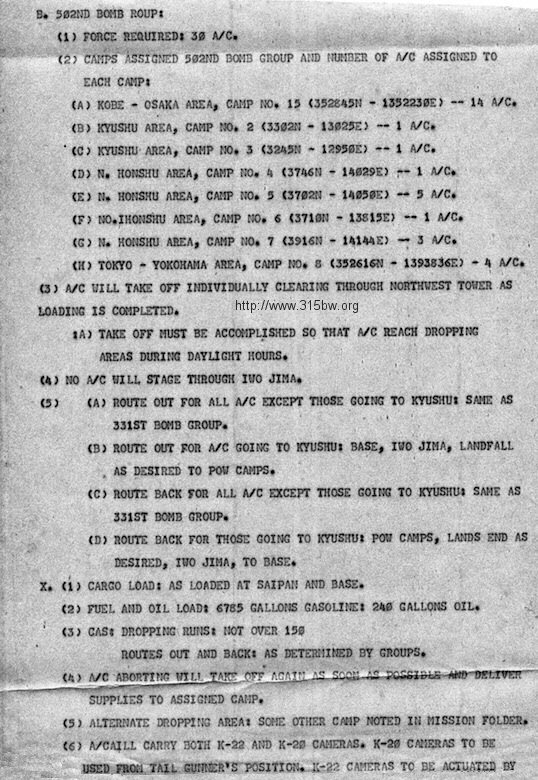 This page provides some data on the effort to resupply those who were Prisoners of War held by the Japanese. All images on this page are UNCLASSIFIED, regardless of any stamped or printed security classification. 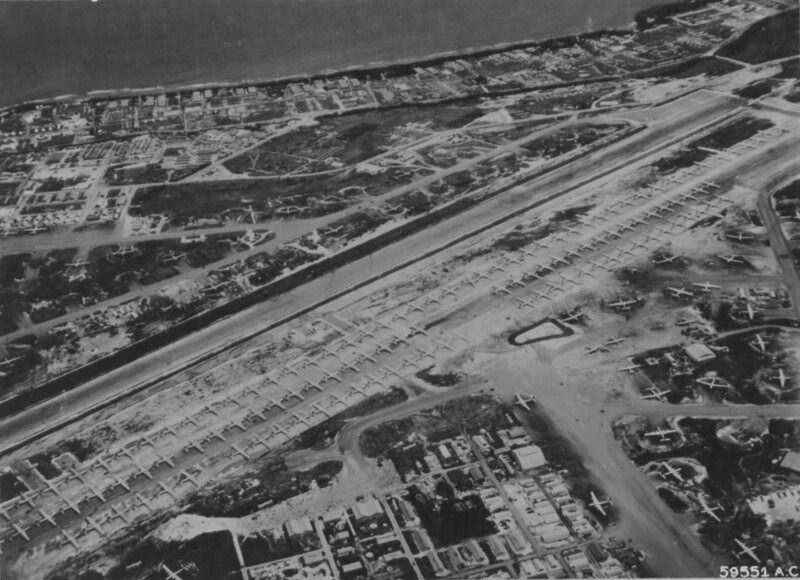 B-29s of the 20th AF assembled on Baker runway, Saipan, Marianas Islands to load food and clothing to be dropped to PW Camps. The images shown below are also from the National Archives. Thanks to Rob Williams, who visited the archives, obtained and provided the images. 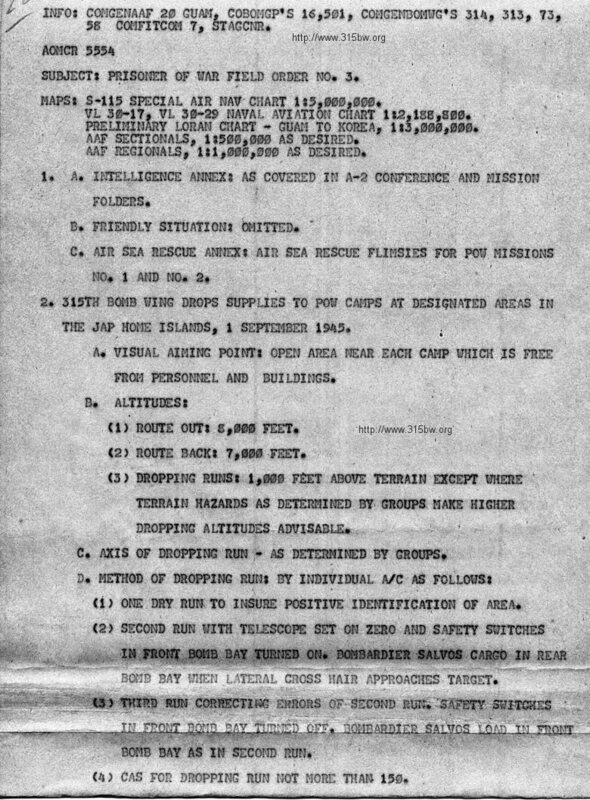 The following TWX is from 315th BW Headquarters to the subordinate groups advising impending missions to obtain Prisoner of War (POW) supplies from Saipan and prepare for air drops of supplies to POW camps. 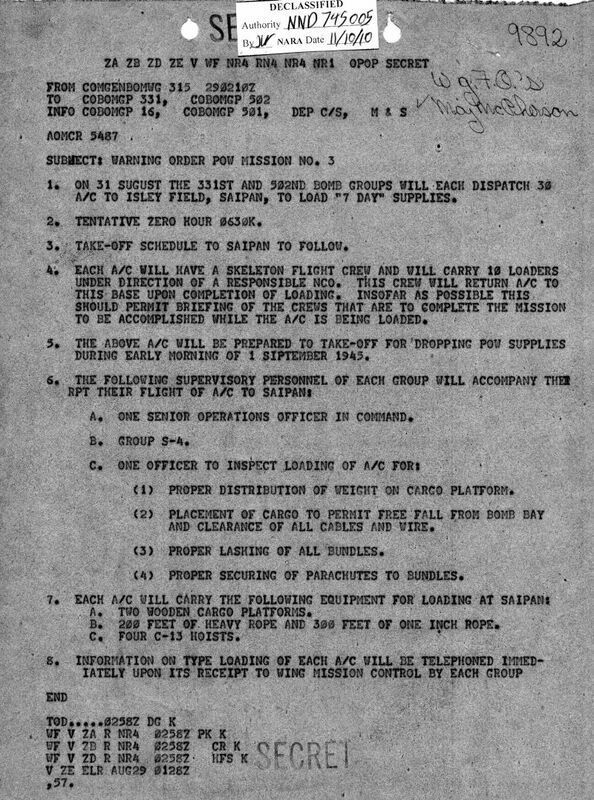 As stated on the subject line, the final instructions for the cargo lift from Saipan. 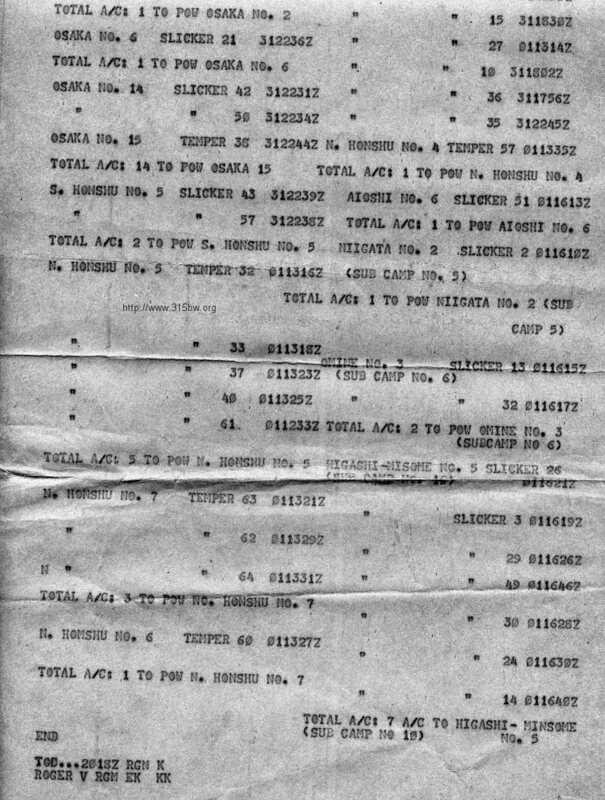 Tasking from the 20AF to identify which camps the 315th were to target for the supply drops. As stated in the message from 20th AF, limits on altitude and drop speed for supply drops. 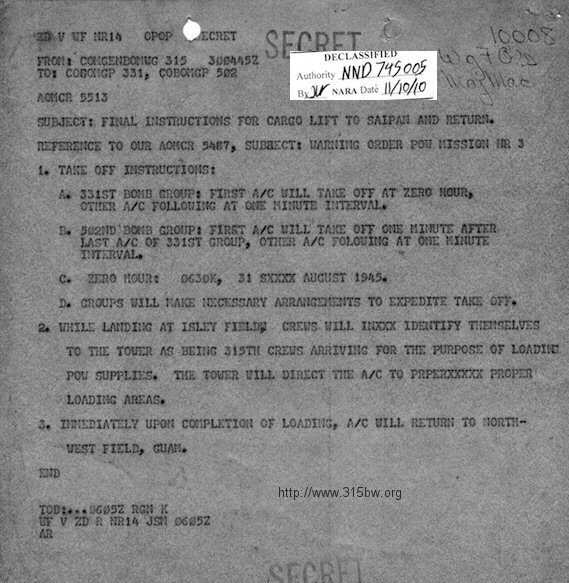 HQ 315th Bomb Wing and sent to the 331st and 502nd Bomb Groups for action. 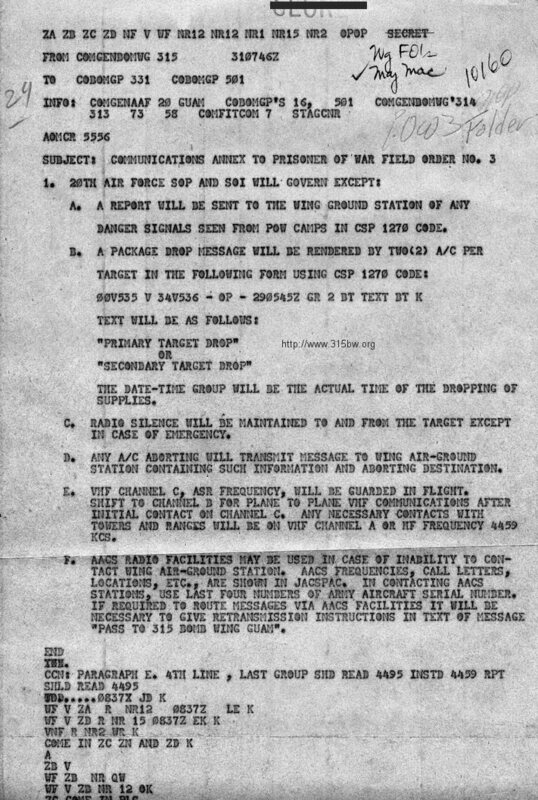 The part of the above message, Field Order #3 that applies to the 502nd Bomb Wing. 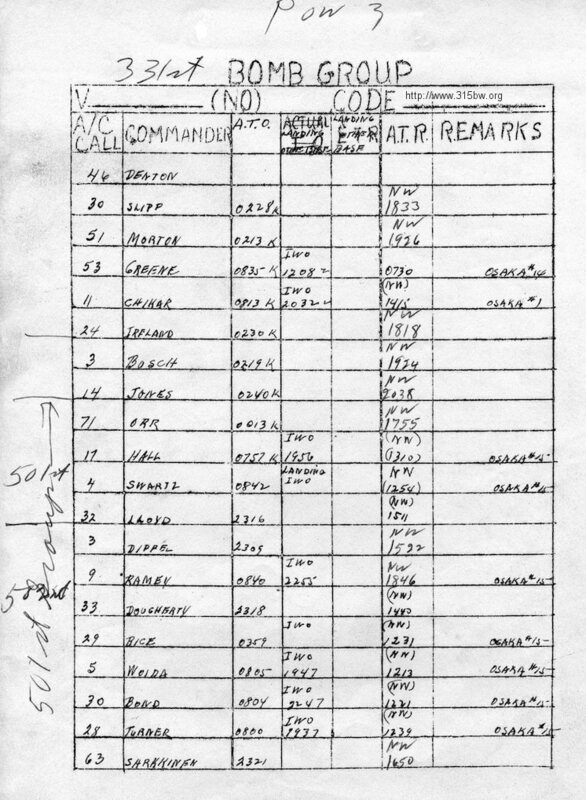 The portion with the tasking for the 331st Bomb Group is missing. 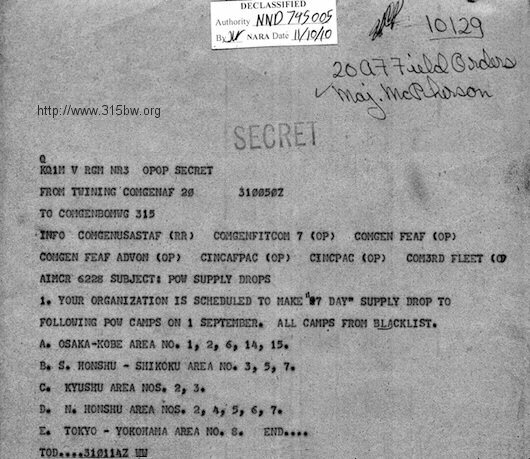 This is the communications annex to Field Order #3. 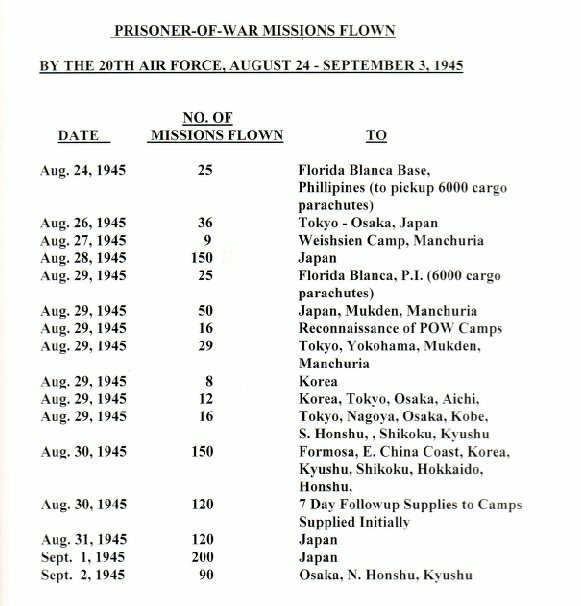 The next three images are mission boards for the POW Resupply Missons. Times are listed as "K" time. That is the local time zone designator for Guam. This time zone is 10 Hours ahead of Greenwich Mean Time (GMT)(known in military circles as Zulu or Z time.). 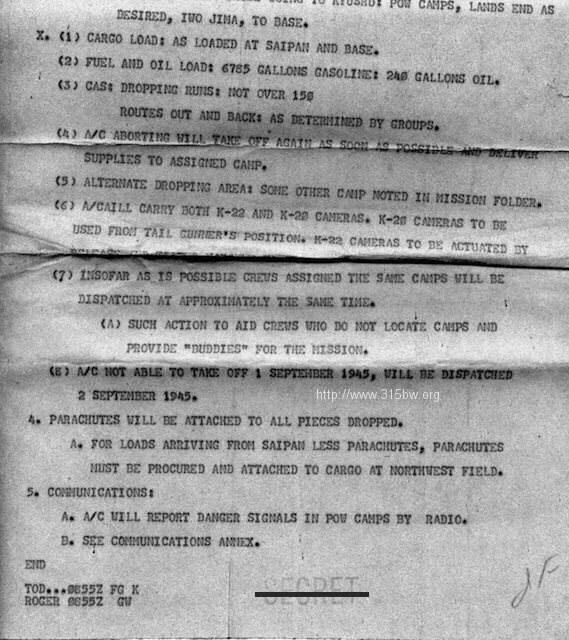 The following is a report on a POW Resupply mission to Northern Honshu island. Slicker was the call sign for aircraft of the 331st Bomb Group. 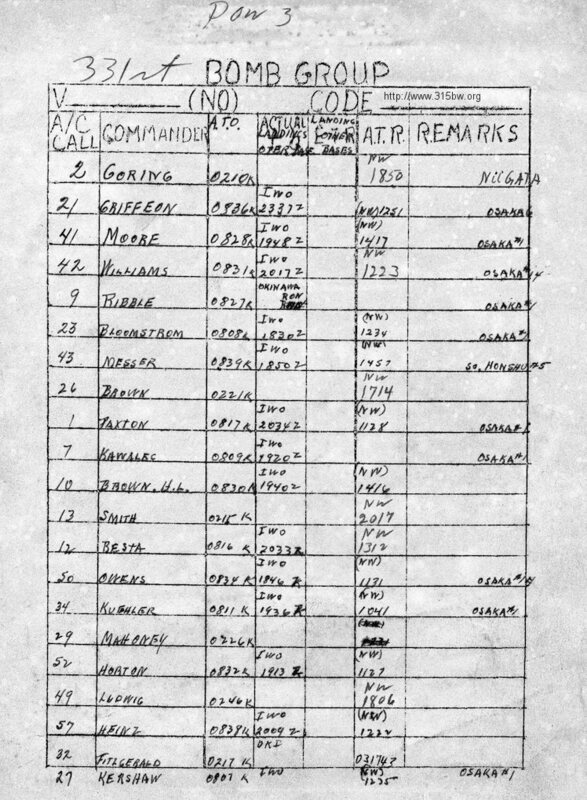 Temper was the call sign for the 502nd Bomb Group. 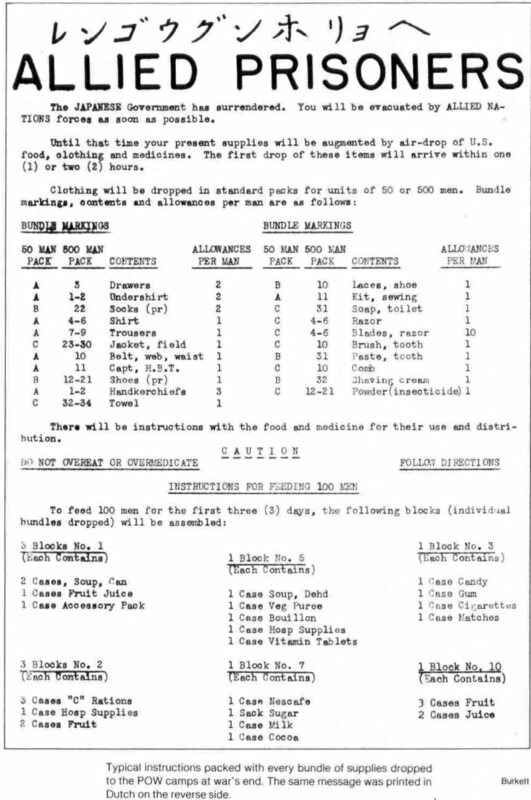 Prior to the end of the war, known prisoner camps were put on the Black List. Perhaps it meant these areas were off limits for bombing. 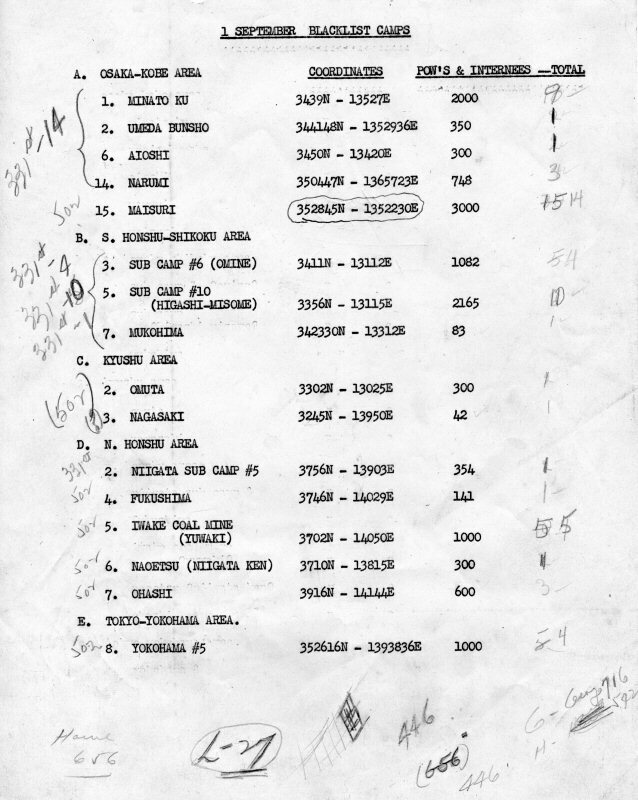 As part of the armistance agreements, the Japanese were required to provide a list of prisoner camps. This list was far from complete and was termed the "Yellow List." Images of the 20th AF summaries of total drops. 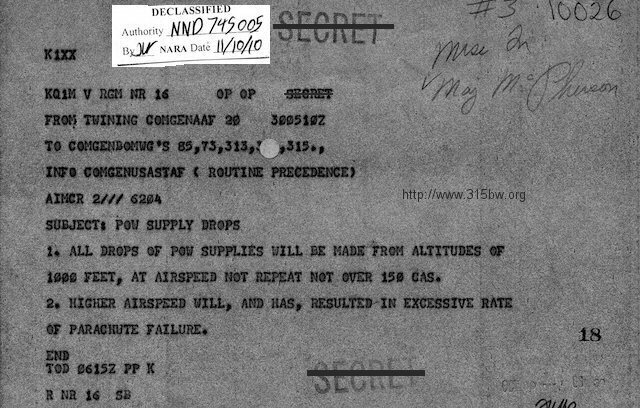 The following information relates to 315th Bomb Wing taskings and results. The data is taken from various sources and each section is presented approximately how it shows on the original sources. 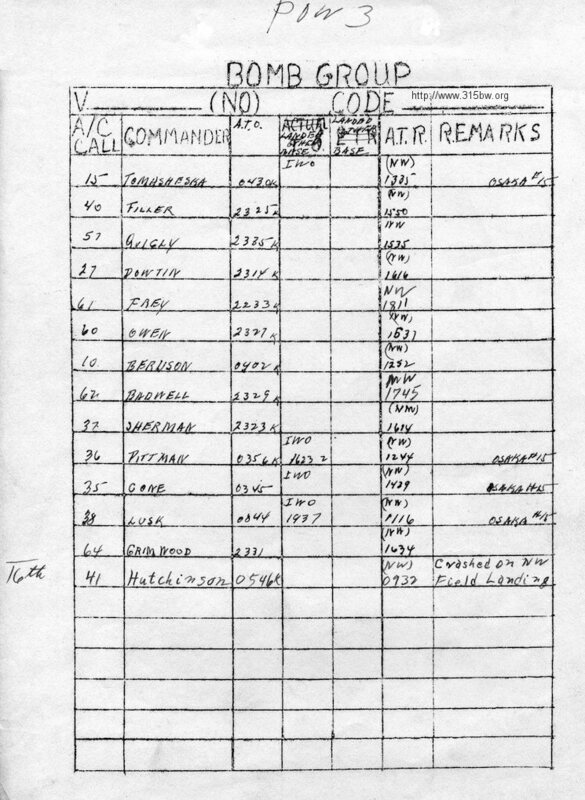 Reports are numbered in the order issued. 4. Total packages airborne: 34. 5. Camp & Package Informatino: A. 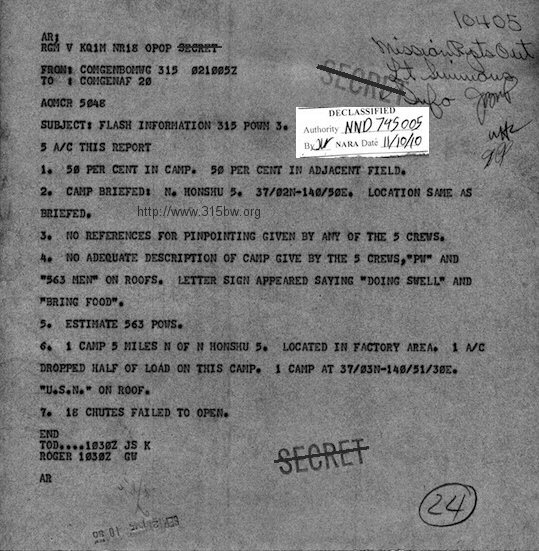 Briefed as camp #15, Kobe-Osaka Area, town of Maizura (35 28 45N 135 22 30E). 3. Time of drop: Not pertinent. 6. Length of run: Not pertinent. 7. Wind and clouds: Not pertinent. 9. Time of reutrn: Crashed on landing at 012332Z. 8. No a/c failing to drop: 1 (41V536) abort and crashed on landing---reason unknown. 9. No a/c lost: 1 (41V536) Abort and crashed on landing---reason unknown.